Police admit they exaggerated the number of weapons seized from biker gangs at a Waco restaurant following a shoot-out last Sunday that killed 9 people. Initial claims of 1000 weapons were revised to just over 300, including 118 handguns and an AK rifle. Waco police Sergeant Patrick Swanton initially spoke of “1000 weapons” found in and around the Twin Peaks restaurant, but issued a correction on the police department’s Facebook page, clarifying that the actual haul was not quite so sensational. So far, police have recovered 318 weapons in total – including 118 handguns, 157 knives, and 43 other weapons, such as brass knuckles and chains. One of the “other” weapons seized was an AK-47 assault rifle, found in a parked car along with body armor, the police have said. “We do expect the numbers to continue to rise,” Swanton added. Preliminary findings indicate that the dispute initially broke out in the bathroom, and then quickly escalated to include knives and firearms as it spilled out into the parking lot. According to McLennan County Sheriff Parnell McNamara, all nine of those killed were members of either the Bandidos or Cossacks gangs. Their identities have not yet been released. Eighteen others were wounded. Initial reports spoke of at least 50 weapons recovered from the scene, including brass knuckles, knives, and clubs. According to Breitbart Texas, however, the meeting was a legitimate political gathering organized by the biker group Texas Confederation of Clubs and Independents (CoC&I). The conservative news site cited reports from local media claiming only one of the victims was a local resident, and quoted a witness to the melee who blamed the Cossacks biker gang for crashing the event. “These meetings have gone on for 20 years, and we’ve gone all these years without a single incident until Sunday,” the Waco Tribune-Herald quoted Steve Cochran, described as a national bikers’ rights advocate. 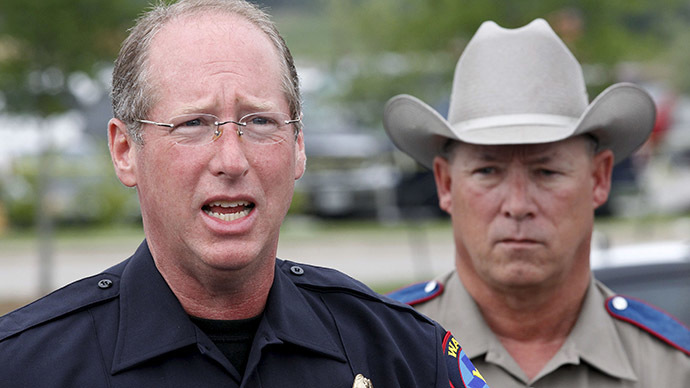 The Associated Press confirmed that four of the nine dead had no criminal record in Texas.